Miscanthus sinensis can propagate through seed. However, there is little information regarding seed germination requirements. The objective of this study was to determine the optimal germination temperature requirements for the species. Seed germination was studied using a two-way thermogra- dient table without light. The temperature gradient in the table had 30 cells with alternating day/night temperatures and 6 cells with constant tempera- tures. The constant temperature cells were 10, 16, 22, 28, 34, and 40 °C, and the alternating temperature cells were a combination of these same temperatures. Fifteen of the alternating temperatures were higher for 16 h and lower for 8 h. The other 15 alternating temperatures were higher for 8 h and lower for 16 h. Seeds exposed to alternating temperatures showed a higher ger- mination percentage value than those at constant temperatures. The highest germination percentage was recorded in cells with a temperature combination of 16 °C for 16 h and 22 °C for 8 h. These results are important to seed analysts developing a standard germination protocol for Miscanthus sinensis seed. This article is published as Christian, Erik J., and A. Susana Goggi. 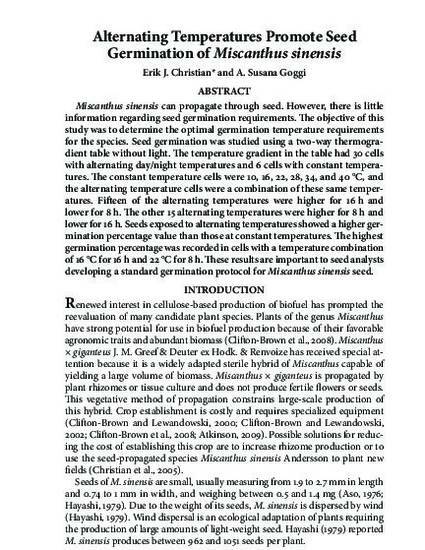 "Alternating temperatures promote seed germination of Miscanthus sinensis." Seed Technology 34 (2012): 249-256. Posted with permission.